This wide-length ottoman with tapered feet adds versatile options to your living area seating. The ottoman makes a great footrest paired with the chair-and-a-half but also makes a fantastic bench for extra seating or an alternative to a cocktail table. 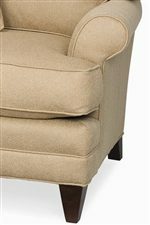 The Klein Wide Ottoman with Tapered Wood Feet by C.R. Laine at AHFA in the area. Product availability may vary. Contact us for the most current availability on this product. The Klein Collection is an extensive premier group touting a very high degree of customized features. The frame of each piece is made using 5/4” or thicker, kiln-dried select hardwoods and is doweled, glued and block reinforced for rigidity and strength. Each piece is designed and gauged to withstand everyday use. This collection will remain resilient for years to come and bring an incredible amount of style and design to any home. All items in the Klein collection are available in your choice of a wide range of custom leather or fabric upholstery options. The Klein collection is a great option if you are looking for Casual furniture in the area. Browse other items in the Klein collection from AHFA in the area.